FastPencil allows anyone - Hobbyists, Authors, and Publishers - to Print and Publish books and e-books. With a global distribution network and easy to use book-building software, print and publishing professionals are selling books while earning more — 80% net royalties are paid to the published author. Sign in now to gain free access to your very own publishing workspace. Alternatively, if you're a PRINT PROFESSIONAL with access to Adobe Pro, use the DIRECT TO PUBLISH (DTP) PDF uploader utility to skip the writing and organizing tools and go directly to Publication Setup:https://fp.fastpencil.com/publications/new?. *Please notice the separate tab for e-Book Upload. To obtain both Print and e-Book from the DTP uploader utility, the publisher must provide both files to perfect specification. Please refer to table on page 6 for information on trim sizes and document length. Color content PDFs should be saved at final trim size plus an additional .125 inches on the top, bottom and face. Example: forbook with a final trim of 6 x 9, document size of provided PDF should be 6.125 x 9.25 (see diagram on page 4). 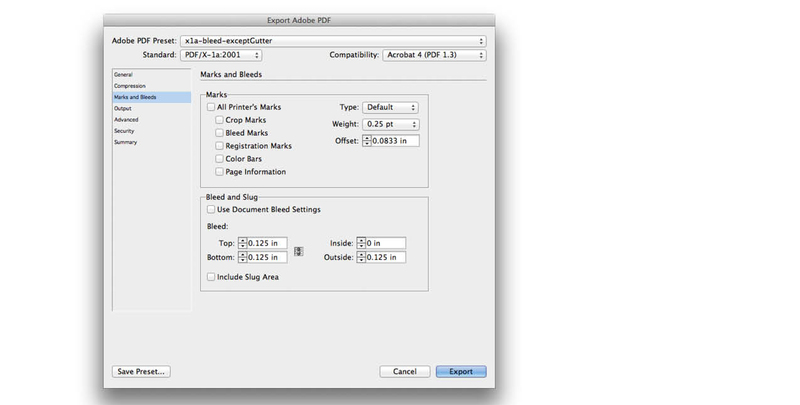 Do not save PDF as spreads (2-up per page). These will process incorrectly. Images should be high resolution: 300 PPI for continuous-tone images, 600 PPI for black & white line art. All fonts must be embedded. PDF file should be saved in CMYK color format. Do not include spot colors or embed ICC profiles. Crop marks are not recommended as they may appear infinal print. The number of pages must be an even number of pages. If the number of actual content pages is odd, then you must include an additional page at the end of the book to make it an even number of pages. The first page of the interior content always starts on the right-hand side. Keep this in mind if you are creating a book with spreads. Any full-spread has to start after the first page (e.g. pages 2-3). Keep text away from edges a minimum of .5” on all sides (see diagram on next page). Elements such as body text, headers, footers and page numbers should be kept in the safety zone. Books with elements outside of the safety zone will not be rejected but will be processed as recieved. 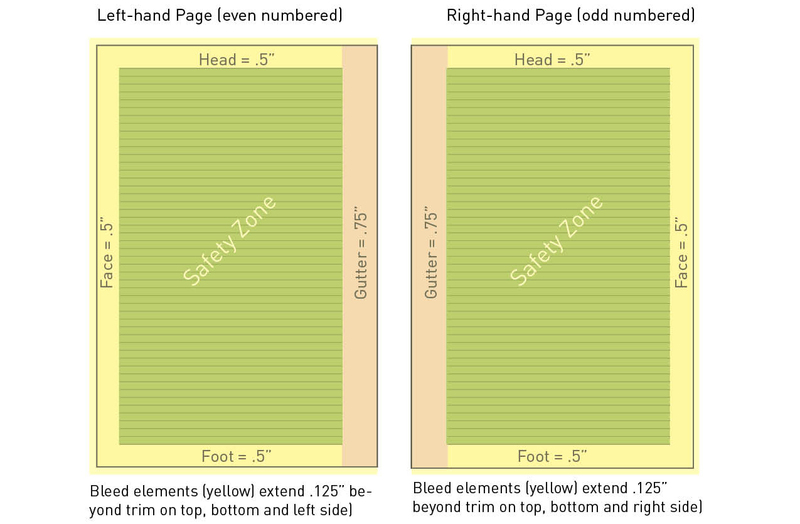 There is a chance that elements outside of the safety zone will get cut off during the trimming and binding process. Please note: The PDF upload tool is for PRINT PROFESSIONALS with access to Acrobat Pro.